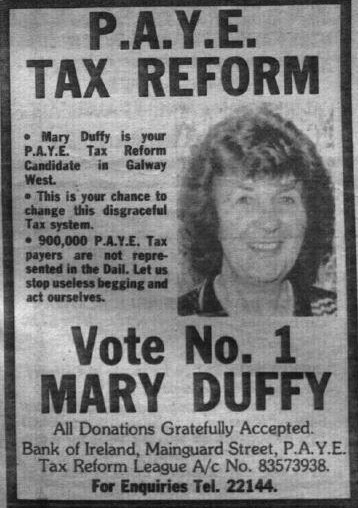 From the 1987 General Election an Ad for PAYE Tax Reform League candidate Mary Duffy running in Galway West. Duffy polled 862 votes. The Tax Reform League stood in the 1987 General Election (I’m not sure if they were a registered party). Aside from Mary Duffy, they fielded at least 4 other candidates. Camella Cummins stood in Meath getting 636 votes. Timothy Cahill stood in Dublin South Central and got 711 votes. Patrick McKiernan stood in Cavan-Monaghan getting 1,868 votes. 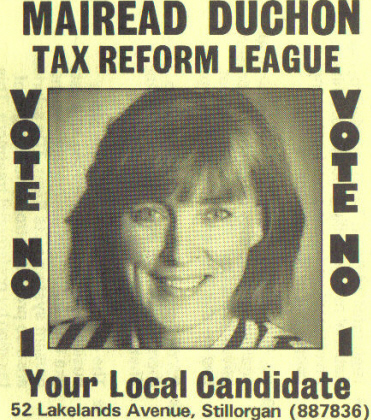 The Tax Reform League candidate, Mairead Duchon from the 1987 General Election in Dublin South. The Tax Reform League stood in the 1987 General Election (I’m not sure if they were a registered party). Aside from Mairead Duchon, who got 1253 votes, they fielded at least 3 other candidates. 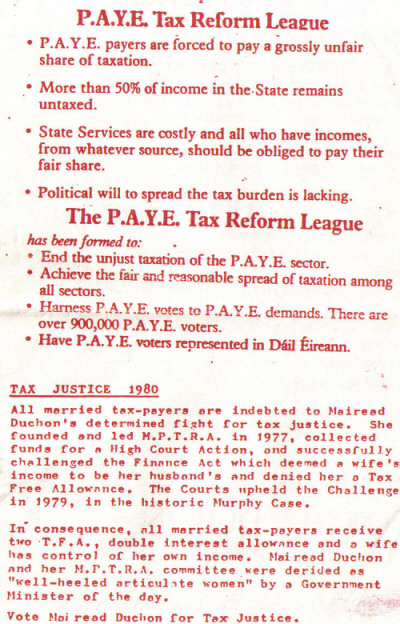 1987 and the tax burden on the PAYE worker was massive. The tax rates for PAYE workers were 40% and 65%. Even after the tax marches of the 70s and 80s there was still a major issue in that sectors of society such as the self-emplyed/farmers and the super rich were able to avoid paying tax. In hindsight, we also know now of the non resident accounts, Ansbacher and so on. As far as I’m aware, The Tax Reform League only fielded candidates in one general election and may not have been registered as a party at the time. Their call to arms failed to excite the electorate with none of their candidates being elected. Mairead Duchon polled 1,253 votes. From the records I have a second TRL candidate, Padraig O’Neill, may have stood in the constituency also, without much success either.